When I’m shining with KINDNESS is a picture book aimed at kindergarten-aged children. 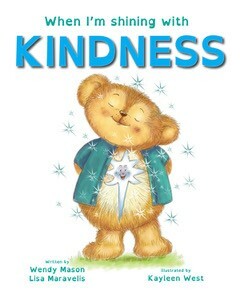 The book is based on the premise that we all ‘shine’ when we display kindness and are treated with kindness. Given that this concept is a metaphorical one, the book helps young children understand the idea by using cute bear characters that have a large star on their chest. The stars shine when the bears display appropriate behaviours and they become dull and misshaped when the bears are treated poorly. The story highlights examples of kindness and introduces the phrase: ‘Stop, look, think, speak!’ as a reminder for young children to behave positively towards others. The book is a part of a series for young children that gently introduces a range of values. This series includes 10 books: Kindness, Joy, Love, Peace (all available now) as well as Patience, Faithfulness, Gentleness, Goodness, Self-Control and Light (launching at a later date). To purchase this book and others in the series visit your local bookstore or kidslightup.com.au. This website also includes teaching notes and handy parent tips.